Hi Aspirants, much awaited Man Booker Prize 2016 winner has been announced and it goes to South Korean author Han Kang. Check the details from below. 1. 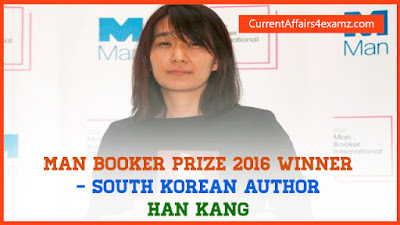 South Korean author Han Kang has won the prestigious Man Booker International Prize for her novel 'The Vegetarian' which deals with a woman's rejection of human brutality and giving up of eating meat. 2. Kang, 45, beat writers including Nobel laureate Orhan Pamuk and international bestseller Elena Ferrante to win the 50,000-pound award which she shared with her novel's translator Deborah Smith. 3. Published by Portobello Books, 'The Vegetarian' was selected unanimously among 155 books by a panel of five judges chaired by noted critic and editor Boyd Tonkin who described Kang's work as "lyrical and lacerating". 4. The Vegetarian' is her first novel to be translated into English by 28-year-old Deborah Smith who started learning Korean only at the age of 21. 5. The Vegetarian is a three-part novel that follows the story of Yeong-hye, a dutiful Korean wife who, spurred on by a dream, decides one day to become a vegetarian, something that is extremely uncommon in South Korean society.